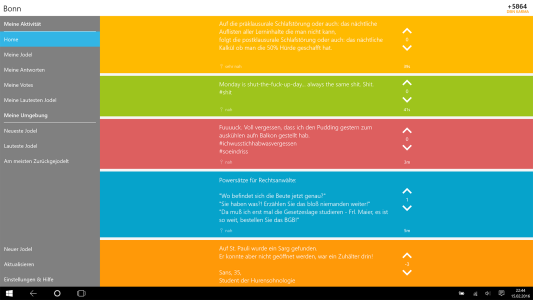 I haven’t published any news about the 1.2 update here, but now it’s time for version 1.3 of the unofficial Jodel app for Windows, Wodel. Version 1.3 adds various functions, that have been added to the official apps in the last months like the Hometown feature, but there also some Windows-specific things like Live Tiles and Cortana. 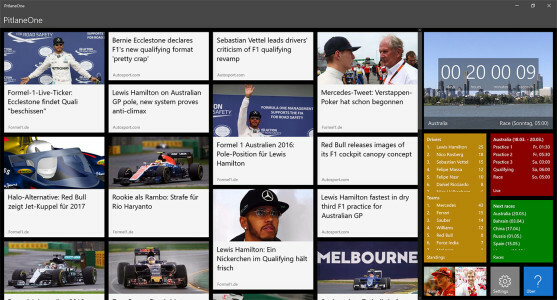 (Deutsch) PitlaneOne ist die einzige aktuelle Formel 1-App für Symbian-Smartphones und eine der Formel 1-Apps für Windows Phone-Geräte. Die App umfasst alle wichtigen und relevanten Daten, Statistiken, Ergebnisse und WM-Stände kompakt verpackt und ist seit dem neuen Update bereit für die Saison 2016, die mit dem Australien-Wochenende am 18. März losgegangen ist. Back in November I came across Jodel because the app was shown to me by another student – of course on an iPhone. As I was working on different projects at that time, I kept the thing in mind and found some weeks later finally some time to start developing Windows app, which is not available from official site yet – of course.